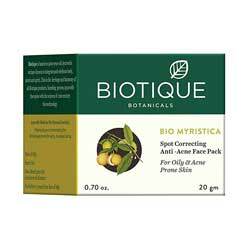 Biotique Bio Myristica Pack Spot Correcting Anti-Acne Face Pack,Pimple Treatment, Controls Skin irritations, Skin redness. Biotique Acne Treatment - Worldwide Shipping. Treats Pimples, Helps to Control Bacteria that causes Breakouts, Redness, other Skin Irritations. This spot correcting face pack treats pimples and helps control the bacteria that causes breakouts, redness and other skin irritations.